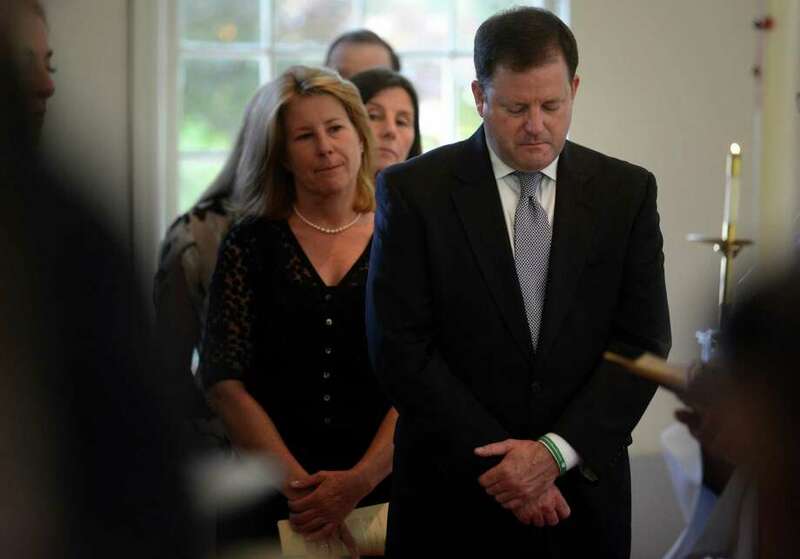 State Sen. John McKinney stands with his siblings Tuesday, May 20, 2014, to pay tribute to their mother, Lucie Cunningham McKinney, during a memorial service to celebrate her life at St. Timothy's Episcopal Church in Fairfield, Conn.
Lucie Cunningham McKinney was remembered as a loving mother, a great friend and a formidable politician in her own right Tuesday, when 500 people packed St. Timothy's Episcopal Church in Fairfield to celebrate her life. In the church for which the Westport resident she and her late husband, Republican U.S. Rep. Stewart B. McKinney, donated the land, Lucie McKinney's five children and 12 grandchildren said she was fiercely loyal, fun-loving and occasionally profane. Politicians from throughout the state, including Gov. Dannel P. Malloy, Lt. Gov. Nancy Wyman and former U.S. Rep. Christopher Shays attended the event. The Rev. Bill Sangiovanni, a family friend of 50 years and Catholic priest who is president of Notre Dame High School in Fairfield, said during a 20-minute reminiscence that she was one of a kind. "Guess what: There was never one like her before, and there will never be one like her," Sangiovanni said. "Why? The reason is simple. God broke the mold after he made Lucie." Sangiovanni especially remembered Lucie McKinney's singlemindedness in fighting to open a residence for AIDS patients in Fairfield after the 1987 death of her husband from the disease. Sangiovanni's good-natured recollections -- including the story of an Italian cruise on which Lucie, an equestrian, rode a vacuum cleaner after a night of mirth -- grew tearful for his friend, who died from cancer on May 10, at age 80. "Only true friends' footprints are on our hearts," said Sangiovanni, who assisted the Rev. Matthew Calkins, pastor of the church. An heiress to the Standard Oil fortune, Lucie McKinney was also a philanthropist. One of her recent donations included $500,000 to the building campaign of the Westport Weston Family Y. "The fitting response to this life today is life," Sangiovanni said. "That's right -- your life, my life, our lives, hopefully lived a little bit more selflessly." Eldest son Stewart B. McKinney Jr. recalled how, during his father's nine terms in Congress, Lucie was essentially a single mother most of the year. State Senate Minority Leader John McKinney, 50, the youngest of the children, recalled his father's blue-collar origins in Pittsburgh that caused a memorable outburst during the 1982 election season. During a debate, Stewart McKinney's opponent tried to claim the incumbent was wealthy and out of touch. "So my mom," John McKinney said, "not afraid to speak up on his behalf, stood up during the debate and said, `It's not his money, it's mine.' "